Alaska Air Group's Earnings May Soon Normalize: Time to Buy? The carrier is still digesting its acquisition of Virgin America, but a rebound in earnings is imminent. Both legacy airlines and low-cost carriers (LCCs) have recently tilted out of favor with investors due to rising fuel costs and heightened competition. Alaska Air Group (NYSE:ALK) has figured as one of the hardest-hit, losing approximately 30% of its stock price over the last 12 months. In addition to cyclical factors, the company has ceded some of its traditional operating efficiency as it integrates Virgin America under the Alaska Airlines brand. 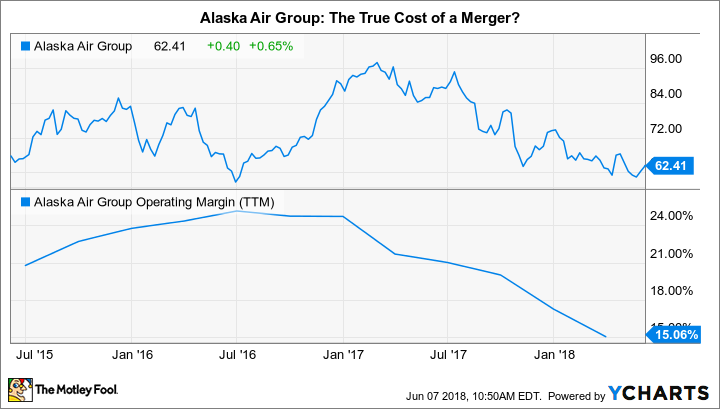 As you can see in the chart above, Alaska has shed about 10 percentage points in operating margin since the merger's completion in December 2016, and that deterioration is a significant factor behind the slumping price trend line. In the first quarter of fiscal 2018, Alaska's operating income dropped to just $26 million against $157 million in the prior-year period -- a plunge of 89%. During Alaska Air Group's first-quarter 2018 earnings conference call, CFO Brandon Pedersen outlined some of the headwinds buffeting operating income, while also relaying management's attitude toward declining profitability: "Our near breakeven results came during a time of merger integration activities, significant new market development, rising fuel prices, new labor agreements and continuing the areas of competitive pressure in our network. I want to underscore [a] very important message... we're not happy with our results and we're taking a number of meaningful steps to improve the profitability of our business." Alaska Air Group's Boeing 737-700 cargo freighter, the world's first conversion of a passenger Boeing 737-700 to a cargo plane. Image source: Alaska Air Group. Many of the factors listed by Pedersen above have already begun to resolve. Due to recent contract negotiations with pilots and flight attendants, as of March 2018, 80% of Alaska's payroll is now represented by market-based collective bargaining agreements (CBAs). This should stabilize what's acted as one of the more significant pressures on CASM (cost per available seat mile) in recent quarters. In a preview of the current year, I mentioned that Alaska has achieved annual capacity growth of 7% for roughly 20 years -- an enviable expansion rate for a carrier of its size. This steady growth supports the company's perennial top-line momentum. But in light of Alaska's current margin pressures, management has dialed back its near-term capacity plan. As a result, capacity is now expected to increase just 4% in 2019 and again in 2020. As my colleague Adam Levine-Weinberg recently explained, Alaska is curbing both mainline and regional air fleet expansion as part of this more disciplined plan. A temporary easing of capacity growth should help the carrier exercise tighter cost control and optimize revenue from routes acquired through the Virgin acquisition -- not to mention a plethora of added routes since the transaction's completion. As for what's transpired in the nearly 18 months since the deal closed, we can surmise that the heaviest burden of integration costs are now behind the company. Alaska received its single operating certificate from the FAA on Jan. 11, 2018, and in April, the organization switched over to a single passenger service system (PSS), migrating Virgin America to Alaska's own reservation system hosted by Sabre. According to management, the PSS is a key piece in realizing promised merger efficiencies. Alaska is also paying attention to a primary lever of operating income growth and employing a host of new strategies to raise its revenue profile. The company has projected $100 million in annual incremental revenue from the 2018 introduction of a new fare class called "Saver Fare." This is a slightly more specialized version of the so-called basic economy fare now offered by several legacy airlines. Passengers holding this ticket will board last, in the rear of Alaska's aircraft. However, unlike most basic economy tickets, Saver Fare passengers will still receive a seat assignment in advance. In addition to Saver Fare, the company will implement new policy enhancements and revenue changes that should boost the top line by another $50 million. These include the use of improved technology to increase ancillary revenue opportunities after the initial sale of a ticket, the introduction of dynamic seating in premium class, and an upcoming ability for passengers to be able to purchase exit row seats. So, exclusive of the wildcard of fuel cost, which is common to all aircraft carriers, Alaska Air Group should see better margins ahead. The organization has already crossed the most intensive phase of Virgin America integration. Cost management, capacity discipline, and revenue strategies will provide a base for improving operating income. When you couple this with revenue synergies that will be achieved from a larger combined fleet and single loyalty program, the intermediate term looks reasonably robust for the Seattle-based carrier. Now might be an opportune time to begin building a position in Alaska Air Group.